Looking for a savings account with more than 0.01% APR to put your emergency fund in? For those that have refunds or a bonus coming in, we have lots of advice on where to put that extra cash. We started out by looking into the best savings accounts. What can you use a high interest savings for? A trade-off for a high-interest rate is that many are online only. You can use this as an advantage, so that you aren’t tempted to use it, but if you have a real emergency where you need cash right away, we suggest going for the accounts that have a debit account. OK here is the master list! These are all FDIC insured, so you have some ease of mind. 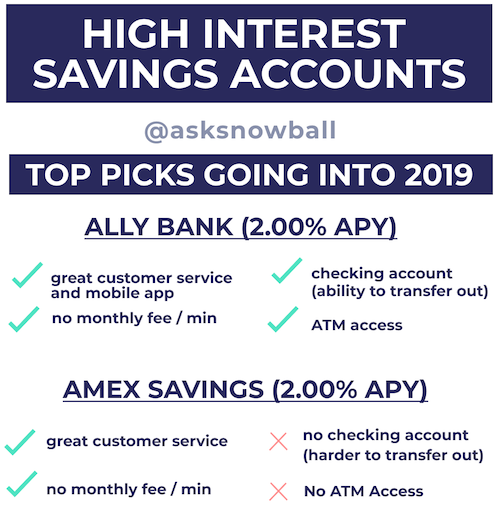 If having access to an ATM is important, check out Ally. Are you making the right money moves? Get simple answers to your complicated financial questions...for FREE!